I attended two theatrical season opening events this week: Helsingin kaupunginteatteri and Svenska Teatern. They're two of the biggest theatres in the Finnish capital, one Finnish and the other Swedish-speaking. The feeling persists that Tuukka Leppänen will be quite something as the title character of Helsingin kaupunginteatteri's upcoming production of Doctor Zhivago the musical. Doctor Zhivago, a musical by Lucy Simon, Michael Korie, Amy Powers and Michael Weller, has only been produced three times before: a test run in a Californian theatre in 2006, then a revised production premiering in Australia in 2011 and a run in Korea in 2012. So, Helsingin kaupunginteatteri's production will not only be the Nordic premiere, it'll be the first production of the musical in the whole Europe! After last year's Fiddler on the Roof, the king of all overdone classics, I'm glad Helsingin kaupunginteatteri is taking a chance with an unknown musical. Though, from what I saw and heard in the season opening, I feel a strange familiarity... The musical is based on Boris Pasternak's classic novel where the events are tied to a revolutionary movement. The director Hans Berndtsson told that the piece's central themes are love and pain. It was mentioned the musical is sung-through. "Doctor Zhivago is a story is about love in all of its most difficult forms, but it's also describes the suffering of the Russian people in the beginning of the 20th century", Berndtsson described the musical's plot. "The original novel is one of the darkest in history, but the theme of love draws people to it." Sounds rather familiar, right? The original Les Misérables premieres in Tampere this fall, so Finnish audiences can compare the two themselves. 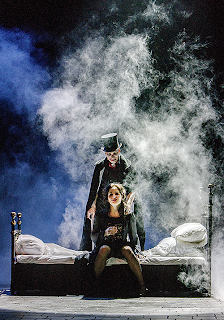 Or maybe Zhivago is Helsingin kaupunginteatteri's late answer to Svenska Teatern's Kristina från Duvemåla – yet another spectacle that strongly resembles Les Mis? In any case, dramatic and pain-filled musicals are my favourites, so I'm excited! I like the songs already. And, as mentioned earlier, I don't think you can go wrong with Tuukka Leppänen... No complaints about the other leads, such as Anna-Maija Tuokko, Marika Westerling, Esko Roine and Antti Timonen, either. The theatre also presented their other 13 premieres for the fall. Sadly, I don't think anyone over ten but under 40 years old would find the selection too interesting. Children's plays, parenting troubles, the struggles of the elderly... It was briefly mentioned how the theatre wants to work with young people and help them find an interest in theatre. More productions with themes people under forty can relate to could be one way to go. I visited Svenska Teatern's season opening event this week too, and just like with HKT, I was mainly interested in the new musical of the season. HKT is not the only theatre in Helsinki premiering an unknown musical this fall. Svenska Teatern, Finland's biggest Swedish-speaking theatre, is premiering Djungelboken. Originally called A dzsungel könyve, it's a Hungarian family musical by László Dés, Péter Geszti and Pál Békés that's never been seen in Finland before. The Svenska Teatern production will be directed by Hungarian director György Böhm. Patrick Henriksen, Birthe Wingren (who stole my heart as Kristina från Duvemåla's Ulrika) and Arne Nylander, among others, will be playing the leads. Maybe the theatre felt that after last year's no doubt expensive Kristina från Duvemåla (and possibly before next year's Mamma Mia!..? ), something a little smaller on scale and for a different audience was needed for this season. This seems like quite a nice choice to fill that void. From the little previews we saw in the season opening, it seems Djungelboken is going to be a colourful and energetic musical. Still want to see more? Bonus videos: Doctor Zhivago, Djungelboken. I'd love to write about other Finnish theatre season opening events too, but sadly, I can't make it this year... For the next two weeks, I'll be visiting Washington, USA, you see! Talk to you when I'm back in Finland again! 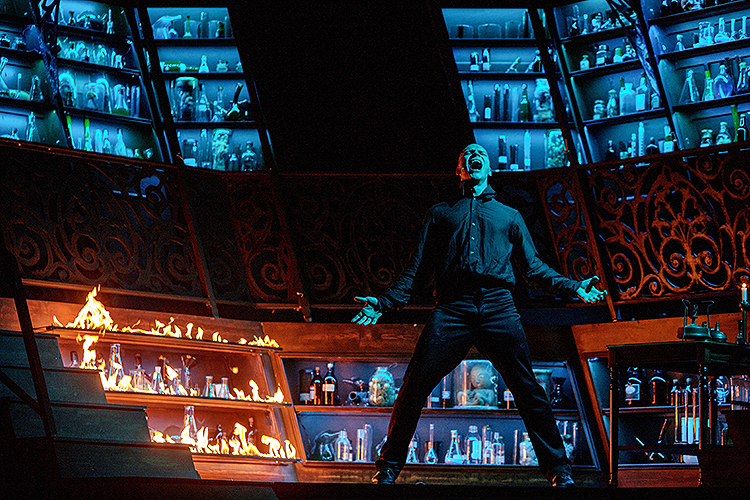 Last spring, I saw Turun kaupunginteatteri's production of Jekyll & Hyde twice. After the first time, I felt I need a second viewing before I can write a review. The feeling persisted after the second time. However, seeing how I've had the whole summer to ponder about this, I guess it's no use procrastinating about this longer. Usually, the more you think about something, the more sense it starts to make. But when it comes to Jekyll & Hyde's plot, I have opposing feelings: here, a little thinking just makes everything worse. The characters' motivations aren't explained, you don't really know why they do what they do... All in all, I feel the musical would need some rewriting, and I suspect I'm not the only one who thinks so. Add some dull songs and odd lyrics and you have a mess any theatre lover would have a reason to criticise. However, for once, I don't even care. This production has stolen my heart. It's maybe the best musical I saw during the 2012–2013 season. Sometimes, pure glitter and glamour is all you need. 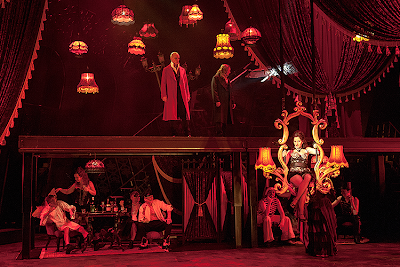 Turun kaupunginteatteri's Jekyll & Hyde delivers that. It's one of the prettiest productions I've ever seen in Finland and firmly in my top five of prettiest productions anywhere ever. I love it when things are done big. There are times and places for simple and minimalistic, but I adore a full-blown period-costumed spectacle spiced with some flames and bulletwounds. 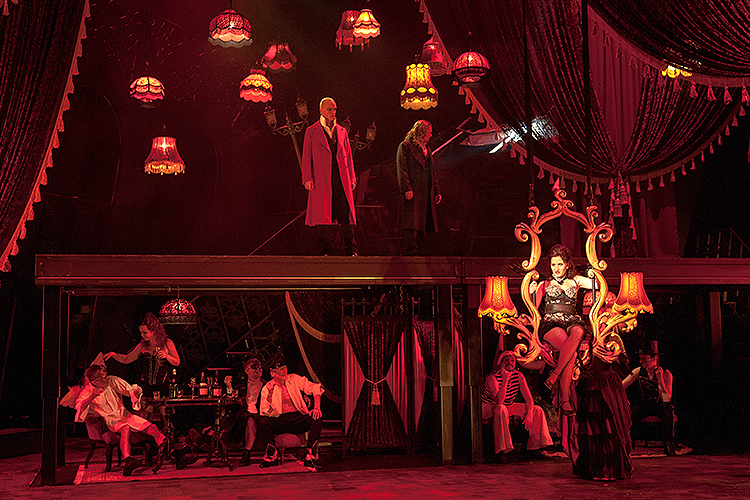 Jekyll & Hyde has it all. The set is big and beautiful. From leads to every member of ensemble hidden in the shadows of the set, every costume is lovely to look at. And the special effects, blood and pyrotechnics! They all left me staring at the stage with my mouth open. This production is absolutely beautiful. Teemu Loikas's sets, Pirjo Liiri-Majava's costumes, Janne Teivainen's lights, the work of everyone involved with the visuals of this production – my applause. Luckily, the acting and singing are just as good as the visuals. I guess everyone was a bit surprised when first hearing Riku Nieminen would be cast in the titular role. He is famous in Finland for many things, but not for starring roles in musical theatre – before now. Based on the little I knew about the show beforehand, I thought Nieminen seemed quite different from the other actors famous for the role and wondered if he's really the best one for the part or if it's just a case of stunt casting... After seeing the show twice, I can safely say he's a great pick. Especially when remembering this is his first leading role in a musical, I think Nieminen's singing was impressive. Some strained notes here and there, but as a whole, I loved listening to his voice. I also admired his physicality. How is it even possible he can do a backflip and sing at the same time..? Nieminen's acting was also impressive, he did a good job portraying the main character's both sides. Reading the book the musical is based on, I was disappointed that Henry Jekyll's looks changed when he took the potion that transformed him into Edward Hyde. It was also underwhelming to find out that many productions of the musical do something similar, with tricks such as different hairstyles for Jekyll and Hyde. I feel it's much more fascinating if the transformation makes Jekyll's personality and mannerisms, instead of his looks, so different that even his friends can't recognise him. Though it demands some suspension of disbelief, I'm glad the Finnish production took the latter route instead of messing around with hairdos. The leading ladies, Jennie Storbacka as Emma and Anna Victoria Eriksson as Lucy, were talented too. It'd be interesting to see their characters explored further, it's a shame the script doesn't allow them to do much else than pine about a guy – but they at least delivered said pining beautifully! Special nod to Severi Saarinen as Jekyll's friend Utterson. His performance ensured that Utterson became my number one favourite character in a matter of minutes. Even though everything else is pure goodness, I have to return to the plot for a minute. 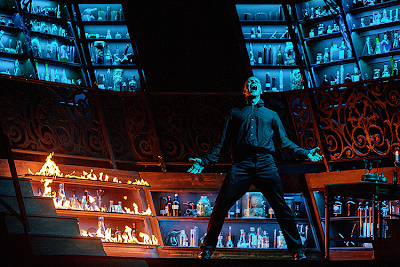 I feel it's a shame the musical doesn't delve deeper into a certain theme: is the main character Henry Jekyll hooked on being Edward Hyde and seeks the transformation voluntarily, or is it an experiment that's gotten out of hand? The director Tuomas Parkkinen mentioned addiction many times before the musical's premiere. I feel the theme could have been explored more thoroughly in the actual show. As it is, the issue is just briefly touched upon. This musical is a treat for those who enjoy coming up with their own backstories and solutions – the plot and direction don't offer many unambiguous answers. I could go on about the plot and its faults for longer, but ultimately, I don't truly care. Sitting in the audience (which I no doubt will be doing in the fall again), the holes in the plot don't bother me. I just enjoy the beautiful spectacle.